This report showcases the results of a telephone survey of 3,856 randomly selected residents along the Gulf Coast. The project was designed to provide insight into how Gulf Coast residents view issues related to climate change, including perceptions of changes in their local climate, individual adaptation, and local government response. This brochure is a summary of recommendations for improving communication that were compiled as a result of extensive interviewing with persons affected by Hurricane Katrina as a part of the Hurricanes, Institutional Procedures, and Information Processing (HIPIP) project. This short document provides an overview of storm surge, including its causes, the factors that influence it and how it is observed and measured. Is Something Wrong With El Nino? 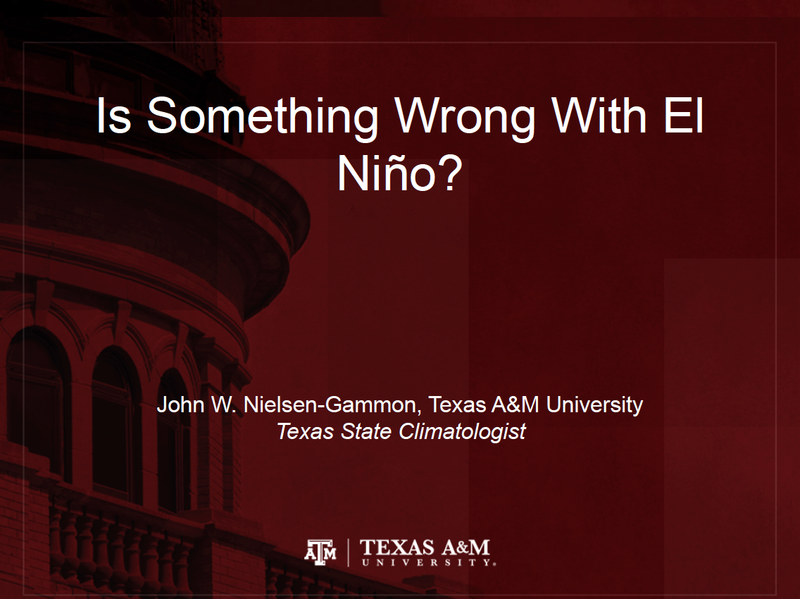 John Nielsen-Gammon's presentation from the webinar El Nino: What's Next? presented on 02/18/2016. The National Weather Service (NWS) and its NOAA partners have released the May 2015 Southern Plains Drought Outlook Summary. Included among the key highlights of this month's Summary are: 1) Drought in full retreat across all 3 states; 2)Many reservoirs in TX and OK now at 100% capacity; 3) Additional rains should improve remaining pockets of drought. This website provides reports for the state of the climate by year. This webpage showcases a variety of NOAA Fact Sheets that highlight a variety of weather and climate-related hazards. This website provides the links to the reports for the NWS Service Assessments. Service assessments are initiated when the following criteria are met regarding a severe weather event: (1) Major economic impact on a large area or population, (2) Multiple fatalities or numerous serious injuries, (3) Extensive national public interest or media coverage, or (4) Unusual level of attention to NWS performance. Some of the major severe weather events that have impacted the SCIPP region and are covered by a service assessment includes but is not limited to: The 2010 Greater Nashville Area Flood, 2008 Mother's Day Tornadoes in OK and MO, 2008 Super Tuesday Tornado Outbreak in the TN Valley, 2005 Hurricane Katrina, 2001 Tropical Storm Allison, and 1997 Arkansas Tornado Outbreak. This documents provides an overview on how climate change can influence ecosystems. This presentation provides a summary of expected impacts of climate change across the southeastern United States. The presentation was provided to the ICLEI network as a webinar on Januar 28, 2010. Copyright © 2019 Board of Regents of the University of Oklahoma. Official webpage of Louisiana State University. All Rights Reserved. For any problems concerning the SCIPP website, please contact us.